Rec: April, May, June, November 1976, BBC Concert Hall Studios, London. Bach�s Well-Tempered Clavier is a set of 24 preludes and fugues, in each major and minor key. Widely considered to be the summit of keyboard music, it is an encyclopaedia of forms and styles, and, especially, of contrapuntal composition. Roslyn Tureck, once called �The High Priestess of Bach�, has certainly marked the twentieth century with her many recordings of Bach�s keyboard music on piano. This recording, made for the BBC in 1975 and 1976, is a welcome addition to her discography. 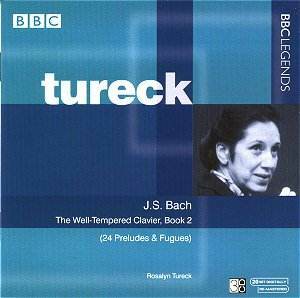 Roslyn Tureck�s landmark 1953 recording of the Well-Tempered Clavier remains one of the milestones in the discography of Bach recordings. However, this set, recorded more than twenty years later, shows the pianist at the summit of her form. Benefiting from an additional two decades of experience with this music, she gives it insights of which few pianists would be capable. Like a photo album that recalls souvenirs from the past. Each prelude and fugue on this recording sounds like something familiar, like a story told in the perfect tone for each piece. Tureck's sense of rhythm is often such that it carries you away. The C minor prelude shows how, with subtle accents on the beats, the dynamic effects of the piano can be used to enhance this music. It is very difficult to review something this good - there are few low points to mention, and so many high points that it is hard to find a place to start. Tureck's emotion takes each piece and places it on a much higher plane than other pianists have ever been able to achieve. Her individuality shines through each bar, each measure, with, above all, a vision, showing Bach as he can be � as he should be. To hell with the debate of which instrument this music should be played on. Here is ample proof that the piano can be the ideal medium for this work. A note on the recording - this "historic" recording has been cleaned up and remastered, but is not perfect. The piano has a clangy sound in the loudest passages, and sounds as if it was miked too closely. This does not detract much from the music. There is also an all too brief interview with Roslyn Tureck who briefly discusses these works. It's a shame that the BBC didn't choose to include longer excerpts from this interview if they are indeed extant. As I said when reviewing book I, this is one of the finest piano recordings of the first book of the Well-Tempered Clavier available. Book II confirms this. In the pantheon of piano recordings of this work, Tureck takes the laurels with two extraordinary recordings: the 1953 set and this one. Together with Glenn Gould's idiosyncratic version, these are perhaps the three reference recordings for this work on piano.